Comfortable parking systems accommodating more cars in less space. As a leading and experienced manufacturer of fully automated multi storey car parks, PALIS® offers longtime experience and a perfected product range. Technically mature and fully working systems are an essential standard of PALIS®. 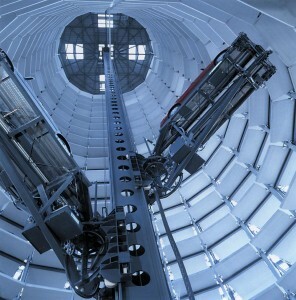 In the begining there was a fully functional prototype in a purpose built system. Not until reliable function was achieved did we promote our system for sale. 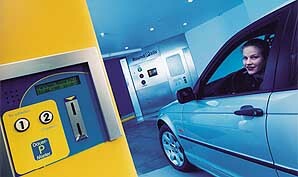 Since then we repeatedly built reliable and high quality automated parking systems and put them into operation. Our shining showcase are the Car Towers at the VW Autostadt in Wolfsburg. Because of our experience and steadiness we even have been comissioned for the advice and rehabilitation of faulty systems by other manufacturers. As your competent full-service partner, our company provides you with all services out of one hand: From the initial project planning all the way to managing your property. In English there are multiple names for the same idea: ‘ automatic parking ‘, ‘ robotic parking ‘, ‘ automated parking ‘. For more confusion the automatic self-parking abilities of high-tech cars are often named the same. A less ambiguous name for our products would be ‘ automatic carpark ‘ , the longer ‘ automatic multi story car park ‘ or ‘ automatic parking lot ‘. The german name ‘ Automatisches Parkhaus ‘ is not as ambiguous.